Heat oven to 350°F. Generously spray 12 regular-size muffin cups with cooking spray. In medium bowl, mix cheese and sausage. Separate dough into 8 biscuits; cut each into 6 pieces; add to bowl, and gently stir with cheese and sausage. Divide mixture by placing 3 pieces of biscuit in each muffin cup. 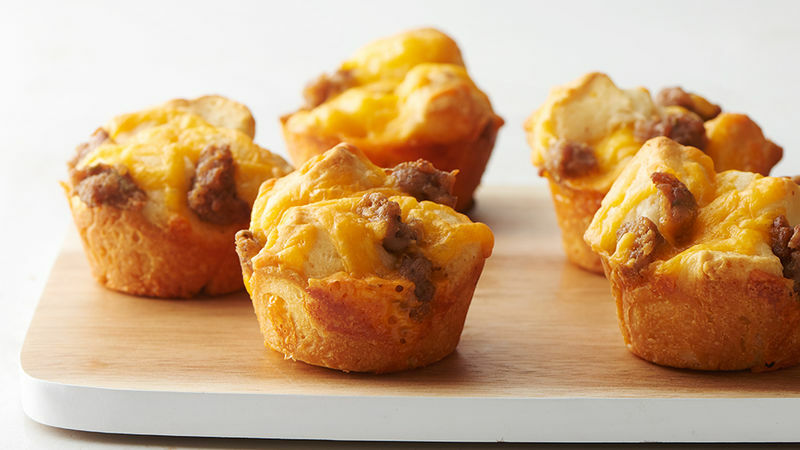 Divide any cheese and sausage mixture left in bowl among muffin cups; top with remaining pieces of biscuit. Bake 22 to 24 minutes or until golden brown and biscuits are cooked through. Cool in pan 2 minutes. Run knife or metal spatula around edges of cups; remove. An easy way to cut the biscuits is with kitchen scissors. Time Saver: Use precooked sausage from the freezer aisle of the grocery store.